Ben, Justin Adams, and Lu Edmonds have formed a new trio. They will be playing in Russia at the Sayan Ring Festival in July, the Creation of the World festival in August, and the opening festival for King's Place in London on 2 October. Ben and Jessica Duchen will be talking about Jessica's new novel, Hungarian Dances at the Cheltenham Festival on 19 July 2008. Ben is a judge in the We Are Listening World of Music Awards. The deadline for entry submissions is 15 August, and the results will be released thirty days later. Ben, Lu Edmonds, and Ian Anderson have formed a new trio, The Blue Blokes 3. They appeared on Sunday, 15 June 2008 at the Big Session Festival in Leicester, 19 June at the Royal Oak in Lewes, and Sunday, 22 June at the Pizza Express in Knightsbridge. The 22 June gig also marked the prerelease of Stubble, their first CD on Fledg'ling Records, which will be officially released on 7 July. They also appeared on DJ Ritu's BBC London 94.9 A World in London on Saturday, 21 June (8-10pm). Nanook of the North with live accompaniment by The Shrine Synchrosystem (Max Reinhardt, DJ Rita Ray, world music kora master Tunde Jegede and Ben Mandelson on guitars) played on 4 May 2008 at the Barbican in London. On 30 March 2008, the Hot Vultures 3 (Ian Anderson, Maggie Holland, and Ben) played at Queen Elizabeth Hall in London as part of Close of Play, an event series curated by Shirley Collins. Billy Bragg & the Blokes' new CD, Mr. Love & Justice, was released on 3 March 2008. The deluxe edition includes an additional CD with Bill playing all of the songs solo. On 24 November 2007, he "presented an overview of Balkan influence on the world music and club scene in London and elsewhere" at an opening conference in Krakow as part of The Other Europeans, An Intercultural Dialogue: Yiddish & Roma Music, Culture & Identity. On 19 November 2007, the animated film Chagall Illuminated was shown at Cargo London. On 20 September 2007, Ben was part of Small But Perfectly Formed, an improv performance celebrating the 65th birthday of Mike Cooper at the Red Rose in London. In 2007, Billy Bragg, Ben, and Lu Edmonds played a number of gigs, including the Southbank Centre Overture. They also appeared at the Tolpuddle Martyrs' Festival on 15 July 2007. Ben was part of the creole 2007 - Prize for World Music from Germany jury. The competition was held in Dortmund on 17-20 May 2007. The production team of Ben and Rob Keyloch also produced Napra's Oh, What a World! in 2007. This band plays "progressive world-music rooted in Hungarian and Balkan folk music." On 27 April 2007, Ben chaired an A&R panel as part of Commercial Realities, a segment of South West Sound 2007 Annual Music Convention in Darlington Devon. Ben and Rob Keyloch produced Cahit Berkay's latest album, released in March 2007. On 11 February 2007, Ben's "virtual additions" to the soundtrack (with Sophie Solomon, Max Reinhardt, Tamar Osborn, and Lemez Lovas) for the film Chagall Illuminated were part of Spiel. 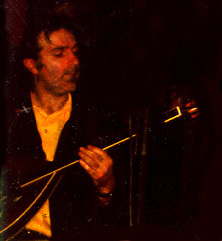 Giovanni Sarani's "Garage Suite" was recorded with Ben on the bouzouki. On 1 February 2007, Ben performed at the celebration for Shirley Collins's MBE for Services to Music, along with Lu Edmonds and Ian Anderson. Bellowhead's first album, Burlesque, was produced by Ben and Rob Keyloch, and released in September 2006. In 1978, Ben appeared on the cover of the Chiswick album LONG SHOTS DEAD CERTS AND ODDS ON FAVOURITES. Can you spot him in this picture? Selim Sesler's 2006 album Oglan Bizim Kiz Bizim (Anatolian Wedding) was produced by Ben and Rob Keyloch. Tiger Moth played the Towersey Village Festival on 28 August 2006 at 8pm. Ben plays on Babar Luck's new CD, Care in the Community, which was produced by Lu Edmonds. On 30 June and 1 July 2006, he played at the Suoni dell'Altro Mondo festival: Incontri 2006 at Villa Penicina, Romagnese, with a number of other artists. On 11 June 2006, he contributed to the semi-improvised score to Nanook of the North at the Rex Cinema in Bristol. Ben and Katsunori Tanaka of Rice Records Japan produced Jaipong Magic, a compilation album recorded in Bandung, Sunda, Western Java. Spring 2006: Piranha's 100th release is Stella Chiweshe's Double Check, which was produced by Ben and the late John Peel. In 2005, Ben produced Boban Markovic Orkestar's The Promise. On 15 March 2006, Charlie Gillett concluded his Invisible Visionaries radio series with a show on Ben Mandelson. You've seen him touring as one of Billy Bragg's Blokes. The unassuming man in the yellow shirt and the dark suit, with the Badge of Mustapha on his lapel. The one coaxing ringing notes from the bouzouk and seamless slides from the bügeleiser. Or an instrument of his own invention, the 8-string barizouki. Or perhaps you're more familiar with his work in world music. As the consultant/director of London-based GlobeStyle Records (a label on Ace Records, established in 1985), he has opened new frontiers for globe-spanning music, with a roster that includes Laver Bariu, Ferus Mustafov, Ofra Haza, Shoukichi Kina, Kadri Gopalnath, Rakoto Frah, and Orquesta Ritmo Oriental. (GlobeStyle Irish has released a series on traditional Irish music that includes selections from Dan Sullivan's Shamrock Band, Hugh Gillespie, and Margaret Barry.) To date, he has worked on at least 99 albums for GlobeStyle. In the early 1990s, he compiled for GlobeStyle Golden Voices from the Silver Screen, collections of Bollywood music. He has also been involved with the post-production of the compilation, Bosnian Breakdown: The Unpronounceable Beat of Sarajevo (Yugoslavia). In 1992, his production credits included Francisco Ulloa's Ultramerengue. He has also produced works for numerous international artists, including a recent album by Madagaskar group Tiharea. He and Ian Anderson recorded and mixed Jaojoby's Salegy! album, and is credited for "invaluable assistance" on Freddy De Majunga's Tsinjaka. In the last few years, he has produced an album by The Uyghur Musicians from Xinjiang. A recent project was the mastering of Malagasy recordings for the all-star Vakoka Project. His work with Malagasy music has also included producing Introducing Shiyani Ngcobo. Also, he produced Yat-Kha's album Re-Covers. Recently, he produced accordionist Chango Spasiuk's Tarefero de mis Pagos, and was lauded by BBC World for displaying "no telltale sign of calculating producer. Ben Mandelson, the man in charge, has no trademark stamp that makes his work instantly recognizeable. Rather, he is the embodiment of the producer as Invisible Man, happiest if you cannot tell that he was even there." For this album, he was nominated for a Latin Grammy in the Producer of the Year category. In 2005, he also produced Czechomor's album, What Happened Next. He's written the liner notes to albums including Eduardo Durao's Timbila, Bajourou's Big String Theory, and the compilation Mozambique Two. For a number of years, he was also the director of the annual WOMEX conference on world, roots, folk, ethnic, traditional, and local music. Now he regularly makes presentations at WOMEX and is the award curator. More recently, he has been an "advisor" for the Modal (formerly known as musicalliance) conference. He is also on the jury for the BBC Radio 3 Awards for World Music, and was part of their 2005 awards-related roundtable on world music. In addition, he is part of the British Council's Music Advisory Network. In 2005, he served on the jury of the Sayan Ring Festival. In Christoph Wagner's book on music, Ear and Eye, he contributed the essay "Skiing in Madagascar - Experiences of a Record Producer." This book also includes pieces by Lol Coxhill, Terry Riley, Jah Wobble, and Colin Bass. Ben's involvement in the world music arena has led to his participation in a number of other events. In October of 1997, he was part of a press conference (organized by Global Music Centre and Star of Africa Association) entitled Music Business and Culture in Developing Countries. He was asked to give "an overview on the music industry in developing countries," and delivered an insightful fifteen-point outline of recording "studio needs" in developing countries. A summary of an interview On Wor[l]d Music, in which he participated, along with László Távolodó Marton (Magyar Narancs) and musicians Tamás Kobzos Kis, Tamás Szarka (Ghymes) and Jeno Zsigó (Ando Drom), can be found here. Asked by On to give a "list of albums, EPs, tracks, ideas, overviews, predictions..." here's what he offered. Ian Anderson of Folk Roots magazine documents Ben's role in the development of "world music." In the March 2001 issue of fRoots, he also conducts an excellent interview of Ben detailing his musical career to date. In July 2003, there is a Root Salad followup in which Ben is asked twelve questions on various topics. At late folk legend Bob Copper's 85th birthday party was spotted a "well known wearer of the Fez and able assistant to one William Bragg..."
A brief (and inaccurate) bio by Craig Harris can be found in the AMG's All-Music Guide. In 1997, he and Michael Morris devised Now You Squeeze It: Accordion Heaven on the South Bank. But what about Ben Mandelson the musician? The violin. The guitar, the hawaiian guitar, mandolin, melodeon, dobro-bass, the banjo, and the harmonica. The bügeleiser. Turkish and Greek instruments such as the bouzouk, cümbüs, and baglama. Hybrid instruments of his own invention, such as the barizouki and resozouki. All of the above and more have been part in his repetoire. A versatile performer, he has also been spotted on various recordings playing instruments as diverse as the tambura, mbira, and hardingfele. His Hardanger fiddle work was sampled on the 1994 CD-ROM, Microsoft Musical Instruments. What is a mbira? See Ray's mbira page! What about the hardingfele? The Hardanger Fiddle Association of America has some answers. In addition to touring and recording as one of Billy Bragg's Blokes (who have a live and in-studio album, The Mermaid Avenue Tour, a number of appearances on compilation albums, and two studio albums England, Half English and Mr. Love & Justice; they have been touring and Ben took a number of photos during their North American tour in 2002), Ben has performed in and with a number of other bands. In another life, he was a guitarist for Magazine on their last album, Magic, Murder, and the Weather (1981), and is featured in the box set from 2000, Maybe It's Right to Be Nervous Now. In the 1980s, he has also played lead guitar in the Orchestra Jazira, and has worked with ex-PiL bassist Jah Wobble on "Body Music Mokili." Recently, you can find him on Susheela Raman's second album, Love Trap, on Acoustic Hawaiian Guitar, Barizouki and Resozouki. (The same album features Yat-Kha members Albert Kuvezin and Radik Tiuliush, and Lu Edmonds in the acknowledgements). You can also find evidence of his work on Colin Bass's album In the Meantime. He contributes vocals to the track "Ship" from the Dear Janes' Skirt. His lap steel is featured in ex-Dear Jane member Ginny Clee's solo album Hold on Tight. You can hear him on his Indian lap steel doing a rendition of "The Streets of Derry" via Shirley Collins on fRoot's August/September 2003 double issue CD. In 2003, he appeared on Abdul Tee-Jay's album Palm Wine A-Go-Go, contributing "kongoma (thumb piano), pennywhistle, plus harmonica and banjo." He is credited with playing the "ghost bouzouki" in a 1987 album by Richard Horowitz and Sussan Deyhim, which was rereleased in 2003 as Desert Equations. On 15 October 2005, he appeared on Charlie Gillett's Another Saturday Night on BBC London 94.9 FM. He also appeared on the November 29, 2003, Saturday Night show as one half of the Tension Mounting Boys, along with Colin Bass. According to the Kartini newsletter, the duo will release an album. 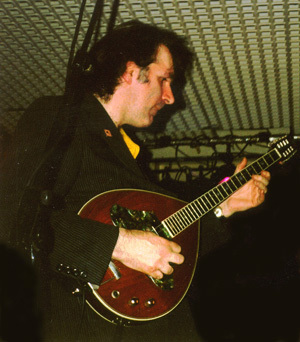 On September 29, 2001, Ben had appeared on the show with Lu Edmonds and a 1923 mandolin. His banjo and melodeon work can be found on The Nursery Boys Go Ahead: Abana Ba Nasery, an album featuring liner notes by one Hijaz Mustapha. He can also be heard on "Diving Duck" (which also features Bob Copper and Ian Anderson) in English Country Blues Band - Unruly : 21 Essential Tracks (1981-1983). Bluesman Corey Harris (who has toured with Billy Bragg & the Blokes) can attest to Ben's considerable guitar/strings skill. Blokes gigs have showcased Ben's bouzouki solos, and featured him sliding with a mic stand. Ben and his violin have guested on other bands' recordings, including (at least) one by the Pogues. He can be heard on Kirsty MacColl's debut album, Desperate Character (1981), and also Shriekback's "Hammerheads" from Oil and Gold (1985). In an early incarnation, a certain Benno Mendelson played fiddle in the Amazorblades, which included a bassist named Ray Cooper. Ever practical, he suggests a camera/tripod case for carrying lap steels to gigs. He periodically teaches a lap steel workshop with fellow Bloke Simon Edwards at the London Resonator Centre: "Workshops will include - Getting to know your lap steel guitar. Trying to make curved shapes with a straight metal bar can bring the sanest person close to fever! Ben will look at ways of tuning, touch, slanting & bends." See Ian Greaves's December 1999 interview for the Magazine pages, Shot by Both Sides, for a summary of his activities. Who is Hijaz Mustapha, and how is he related to Ben Mandelson? It's arguable that Hijaz Mustapha sometimes shares a consciousness and musical instruments with Ben Mandelson. They are, however, not the same person. One of Uncle Patrel Mustapha bin Mustapha's talented nephews from Szegerely, Hijaz is a key member of the legendary 3 Mustaphas 3. 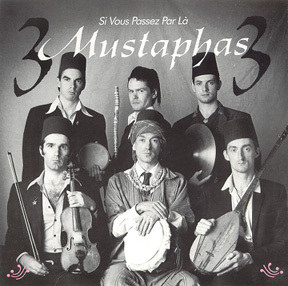 In all their albums and singles, they have fused brilliant narratives and their unique humor/wit with traditional world music forms. various artists: Out on the Rolling Sea: "A Chilling Tale: Harcourt Drowned/Troublesome Water"
various artists: Dark Was the Night: "When the War Was On"
Hijaz the musician's work has been featured in the Mighty Clouds of Dust's EP Champion the Wonder Horse (1983; which features future members of the Pogues). More recently, he has lent his fiddle to the Oysterband's Here I Stand. He also guests on another recent album, John Kirkpatrick's Mazurka Berserker. Hijaz (aka Hank) Mustapha also has production credits that Värttinä (Seleniko), Tarika Sammy (Fanfody), Boiled in Lead (Orb), Dembo Konte, Kausu Kuyateh & the Jali Roll Orchestra (Jali Roll), the Klezmatics (Jews with Horns), Stella Chiweshe's Talking Mbria: Spirits of Liberation, Maurice el Medioni's Cafe Oran, and Tiger Moth (Howling Moth). He has played guitar on and produced a number of Salamat albums, including Ezzayakoum, Nubiana, and Salam Delta. A recent interview can be found here. And then there is Tiger Moth. From the October 2003 issue of fRoots: "Well, if veteran West African bands can do it, why not ancient English dance bands? 1980s reprobates Tiger Moth are reforming for one summer season only in 2004, with most of the original members on board — Rod Stradling (melodeon), Jon Moore (guitar), Chris Coe (hammered dulcimer), Maggie Holland (bass), Ian Anderson (slide guitar) and Hijaz Mustapha (stringed things), augmented by Fran Wade (fiddle) and a drummer t.b.a. to replace the late John Maxwell. Find the old codgers via 020 8340 9651 or email ian@frootsmag.com "
For a summary on the differences between Ben Mandelson and Hijaz Mustapha, a list of their instruments (and the tunings they use for the bouzouk), and other interesting pieces of information, see this article from Guitar Player Magazine. If you're interested in world music (including work by the 3 Mustaphas 3), you ought to have a look at Folk Roots Magazine.